As a framework developer it is essential to have an easy way to individually test the appearance of and the interaction with each custom control. I really hate it when I first have to open five different screens before I finally get to my new control so that I can test it. Not only is it annoying but it also costs too much time. When doing UI work you constantly make changes to your controls and look at the impact of those changes. If a single change roundtrip (code, launch, test) takes 5 minutes then you can only squeeze 12 change iterations into an hour, making slow progress. If it takes 1 minute then you are looking at 60 iterations and fast progress. As simple as that. Luckily the ControlsFX project contains a very nice subproject called FXSampler, which is a generic sampler application for any JavaFX framework. I am currently using it for FlexGanttFX and CalendarFX. The screens below show the individual CalendarFX samples in a hierarchical tree structure on the left-hand side. The selected sample shows up in the center pane. 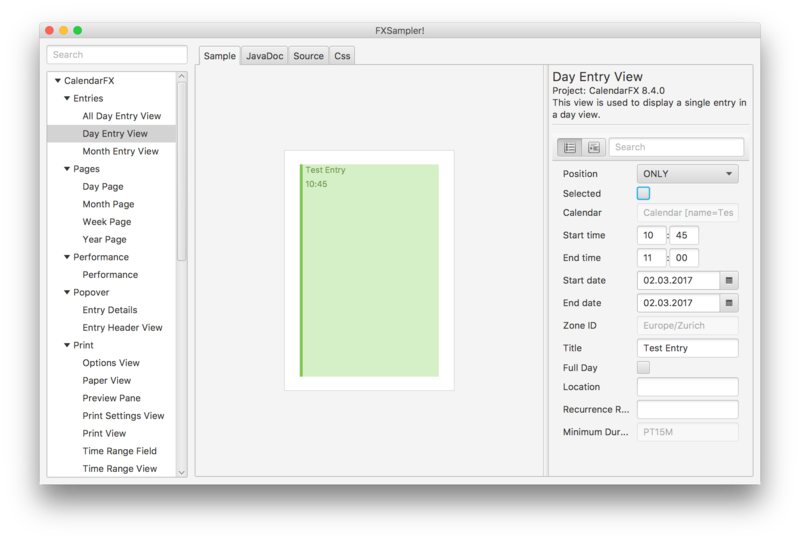 In this case it is showing the view used for visualizing a calendar entry on a weekday. The property sheet on the right-hand side allows the user to edit the properties of the selected control. It should be noted that the right-hand side can show any kind of control for interacting with the sample, it doesn’t have to be a property sheet. However, very often the property sheet is the fastest way of coming up with a good way of manipulating the control. The center pane has several tabs. The first one shows the actual sample. The second one displays the javadocs / API of the control. Ideally each sample shows exactly the API of the featured control and not just the index page of the entire framework API. Which page gets loaded into this tab can be configured individually for each sample. The next tab is used for showing source code. This can be any code that you find relevant for the sample but in my case I always show the code of the sample itself. Tab number four contains CSS styling information that is relevant for the selected sample. If your control overrides the getUserAgentStylesheet() method then the tab should display the stylesheet that is returned by this method. In CalendarFX all controls inherit from CalendarFXControl which does override this method and always returns “calendar.css”. So in this case there is only a single large CSS file and that is what is being displayed here. The next thing needed is a class that represents the sampler project. The class has to implement the fxsampler.FXSamplerProject interface. It is used to specify a project name, a base package, and a welcome page. The code below shows the implementation of this interface as it was done for CalendarFX. The welcome page is optional and allows you to specify a title for the sampler and to show a UI that will be presented to the user when the sampler application starts up. The CalendarFX sampler shows a simple “about message”. FXSampler will use the “base package” to find all classes that are samples. FXSampler will place the samples found in the base package at the top of the navigation tree on the left-hand side of its window. Samples found in sub packages will end up in a tree node. The image below shows the package structure of the CalendarFX sampler project. 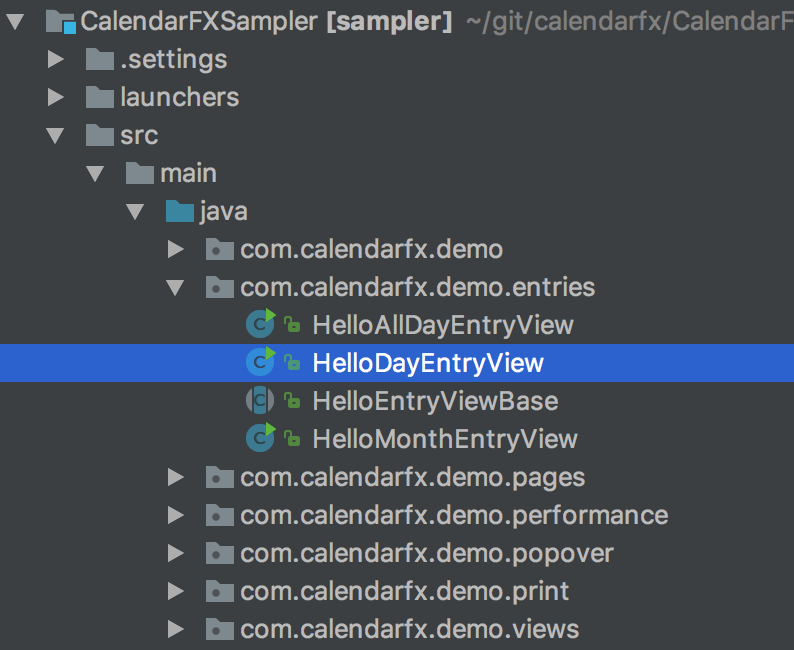 The base package for CalendarFX is com.calendarfx.demo and because the “day entry view” sample was found inside the entries package it means that the sample will be displayed in a tree node called “Entries”. The next image shows how the navigation tree reflects the package structure. You will notice that the samples are all prefixed with “Hello…”. This is simply a convention I inherited from the ControlsFX project. There is no technical reason for it. A class becomes a sample if it implements the fxsampler.Sample interface. 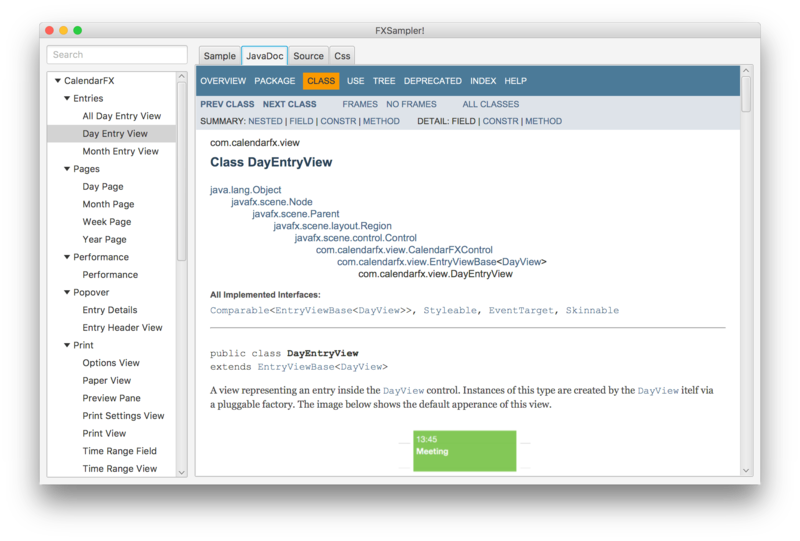 But it is even better if the class extends from fxsampler.SampleBase. The clever thing about this class is that it extends from Application, which means that each sample can also be run standalone. 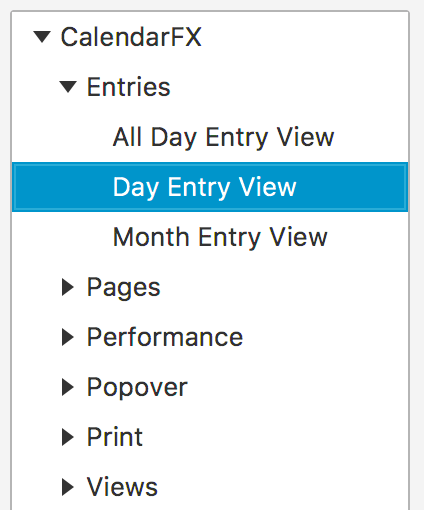 The name of the sample (in our example “Day Entry View”). A short description of the sample / the control (what does it do? what is it used for?). The name of the project that is belongs to. The project version (e.g. 8.4.0). A node that will be placed in the center pane and that displays the custom control. A control panel for manipulating / interacting with the sample (right-hand side, often a property sheet). The position of the control panel divider handle (based on the width requirements of the control panel). The URL to the JavaDocs (I always point to the docs on my server). The URL to the stylesheet that is relevant for the sample. The URL to the source code of the sample. A flag to indicate if the sample is currently visible (good for hiding samples that are still work-in-progress). You will notice that the launcher does not reference / instantiate any specific sampler project. You would normally expect to see the launcher create an instance of CalendarFXSamplerProject but its’ main() method simply delegates to the main() method of FXSampler. So how does it find anything? The answer is simple but not something that every Java developer has encountered in their day to day coding routine. FXSampler finds the sampler project because it will be registered as a “service provider”. This is done by adding a file to the directory META-INF/services. The file name has to be fxsampler.FXSamplerProject. Inside the file we add the full class name of the sampler project. FXSampler can now lookup all service providers that implement the FXSamplerProject and instantiate them. This allows FXSampler to show the samples found in several JARs at the same time. If I wanted to I could create a single application showcasing the samples found in FlexGanttFX, CalendarFX, and ControlsFX at the same time. The image below shows the location of the service provider file and its content inside the CalendarFXSampler module. I highly recommend using FXSampler and making it a habbit to add a sample for every custom control you write, no matter if you are a working on a framework or an application. The benefits of being able to quickly test a control in a controlled environment greatly outweighs the overhead of creating and maintaining the sample.